After itchy red sores broke out on my face, a doctor told me I had a staph infection. ”How often do you clean your mobile device?” he asked. ”They’re more infectious than a New York subway seat.” In that instant, Wireless Wipes were born. 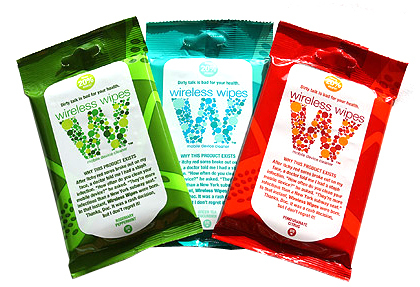 Wireless Wipes come in 3 delicious scents: Rosemary Peppermint, Green Tea Cucumber, and Pomegranate Citrus. Our personal favorite is the Green Tea Cucumber! We get ours at Ricky’s NYC (http://www.rickysnyc.com/). Visit http://www.wirelesswipes.com for more info. I not to mention my guys have been examining the nice guidelines on the blog and then I had an awful suspicion I had not thanked the site owner for those strategies. These guys happened to be passionate to read through all of them and have now in fact been having fun with them. Appreciation for turning out to be well accommodating as well as for obtaining this sort of high-quality subjects millions of individuals are really desirous to discover. My very own sincere regret for not expressing appreciation to you sooner.